There is a Facebook group called "The Parrots Feather" and one of their members Nyla Copp wrote a very good article that I wanted to share with our customers. If you have a Facebook account, I highly recommend that you follow this group, as they have some wonderful information to share about those dealing with feather problems, and the overall general health of our beloved Companions. I became a parrot’s companion and, subsequently, an aviary builder when an adorable Lovebird was found straying about the neighborhood. I didn't know much about parrots. Nonetheless, by the next evening I knew something was terribly wrong. My little foundling had eaten little and was not perching at all. At the avian vet’s, a technician took one look and rushed my new friend directly into the back. Nervously I waited only to have Dr. emerge to prepare me for what seemed imminent. She said things like severe respiratory distress… fluid in trachea… probable fungal infection... gastrointestinal infectionSSSSSSSS... and eventually I heard, probably won't live. So Orlando, as she became known, stayed a week there – most of it in an oxygen tank and when I'd visit, my vet and her staff were giving me crash courses in providing a good home for a bird. It was terrifying. “B-b-but, she’s been sick,” said I.
Dr. made it clear that the fresher, cleaner outdoor air would be the best thing for Orlando’s recovery. And she told me, that birds who go outside suffer far less respiratory irritation overall, than birds who don’t. Suddenly I was exultant! And Doc went on, oblivious to my happy epiphany. She spoke of Orlando's new & improved diet and the magic of sunshine… metabolism…D3… overall health, but frankly I was too caught up in my own joy. Finally! Something about me was going to work for my little bird! Fast forward a few years, and over half of the outdoor enclosures I've been involved with have come about by avian vet recommendation. Clients have usually heard of the general health benefits and have been excited about the enrichment value offered by the great outdoors. But most often, what's tipped the scale and gotten them serious about an outside enclosure is that, suddenly, they are having to work with their vets to address specific conditions including respiratory health & recovery or the many issues around hormonal imbalance. Vets are sending seizure birds outside; sometimes to address the seizure condition itself or, to ensure bone health and strength against a fall. They want birds outside for stress relief or in larger enclosures that encourage play and exercise – dropping cholesterol and enhancing cardiovascular health. At this point, the Birdie Buddy client roster not only includes healthy, fully flighted hook bill & soft bill avian species but also, birds recovering from feather destructive behavior, self-mutilation and opportunistic infections brought about through malnutrition and neglect. Even parrots with permanent disability enjoy and benefit from time outdoors. My special needs birds include individuals who have seizures or, they are blind, splay-legged, amputees (wings, legs, feet or toes), naked or simply elderly. Since 2008, I've had a hand in more than a few outdoor enclosures - whether I've built them myself or provided consultation for folks who are building their own - the fact remains; most of these projects have come about through avian veterinary directive. From where I sit, it's become strikingly apparent that all of us who love and keep these beautiful wild folk in our homes, need to find ways to provide safe and enriching outside time for all of our birds, whether they are healthy, recovering or, indeed, have special needs. The first place to go if you have decided to get your companion outside is your avian veterinarian. Get a well-bird check-up and tell your vet of your plan. Depending on the season, your lifestyle and/or your geographic location, your doctor may have some suggestions for dietary changes, creative outdoor solutions or features to the outside enclosure you’ll need to implement. While it may be a drastic change for you and your bird, your vet is there to help. “A first and vital step towards health is one easily achieved by most owners. A second cage outdoors can provide a horizon-expanding experience for companion parrots. Small birds can be relocated to a safe area on porches or decks where they can be easily observed in their own cages. Even 10–15 minutes outside can offer the benefits of fresh air and some ultraviolet light, and these small forays can provide a small success when owners observe their pets’ enjoyment. In cases where logistics or seasonally inclement weather limit access to the outside, an open window or patio door can offer the same advantages. Relocation to a novel site usually evokes interest and more activity and takes advantage of the instinctive behavior to roost and forage in different locations. Common sense should have told us long ago that companion birds not only benefit from, but innately need, the outdoors that we have denied them. I believe avian medicine is changing things for folks who may have grown up assiduously keeping their beloved pet birds safely warm and dry, often in pine cleaner scented, nonstick cookware kitchens. When Birdie Buddy opened in 2008, I did not know of the client demographic that has grown the business: dedicated companion parrot owners who, in response to their veterinarians' instruction, are finding ways to get the flock outside. Some of the results have been nothing short of remarkable. One of my first residential enclosures had been designed for some clients’ personal companion birds. These folks are, however, deeply involved with our local parrot rescue group and have a very large population of special needs budgies and cockatiels in their permanent care. 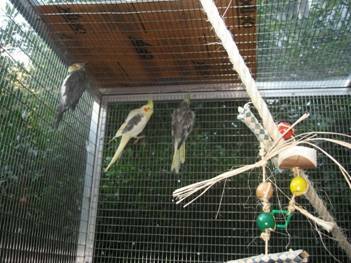 In Aug 2011, nineteen cockatiels who had been, at the very least, neglected and existing in filthy conditions, were surrendered to an animal shelter in a nearby county. The shelter had been working with the rescue group and the birds were evaluated by a Certified Avian Veterinarian. Basic tests found that the five sickest birds had varying combinations of giardia, spiral bacteria (sometimes called spirochetes), and avian gastric yeast (AGY). The attending vet felt that all of the infections were opportunistic – taking advantage of the birds' weakened conditions resulting from poor care and dirty conditions. Medicating all nineteen – not very tame – cockatiels would be difficult and further stress them so Dr. prescribed a lifestyle change; a healthy diet, lots of fresh air, exercise and sunshine. My clients took in four of the five sickest birds. The fifth stayed at the hospital for care. “So the four tiels started a new life. For several days, they would only climb around the walls and roof of the aviary, and seemed nervous about flying (one had so many broken wing and tail feathers, he could not fly). Eventually they would start to fly short hops. The saddest sight I have seen in a long time was the line-up of all four birds first thing every morning – all facing the rising sun. These birds behaved as though they had never seen the sun...and maybe they had not. Each morning, they would line up to face the sun, soaking it up. They all ate anything that was put out for them; although they had been fed a seed diet, there was no hint of “conversion” reluctance. They ate Nutrian cakes and raw vegetables as though they had never seen food. The days went by, with the four birds spending their days climbing and flying, playing with toys, and sleeping in the sunshine. One of this four was Marie, the “matriarch” and the mother of the larger group. She is a charming lady, and tame. She liked to jump on my head from a platform near the door. She was also the sickest of the four in the aviary, with a very heavy AGY infection. Three weeks after they came to live with me, Marie tested free of all infections. No medicine, just sunshine, exercise, and healthy food. Giving your avian companion an engaging outdoor space really is an investment in his or her health. I've personally seen the difference that time outside can make in the overall well-being of a companion bird. An outdoor habitat is a safe place for your bird to enjoy, and benefit from, that direct sunlight and the cleaner air. 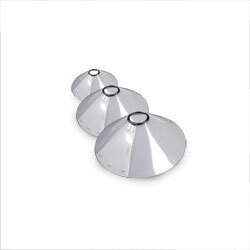 It offers great environmental stimulation and can encourage greater activity. I believe time outside is a vital part of your enrichment program. A customer of ours had a tragic accident 2 weeks ago that took the lives of their pet birds. (2, a half moon Conure and an Indian Ringneck) They were preparing dinner, they were making salmon and they put it on a cedar board and into the oven. Apparently this is how some people prepare salmon, and this cedar board is available anywhere (We didn't know that.) Anyhow, shortly after placing the board in the oven to bake, the one bird, who was on the husbands shoulder, starting to have respiratory problems and started to wobble and fell right off his shoulder. They had no idea of what was happening, it was very sudden, and they rushed the bird to the vet, but it died on the way there. Upon returning, they found the other bird dead in his cage. In doing some research, the husband found out that cedar is very toxic to birds. We HAD NO CLUE about that! In all our years in birds, we have never heard of such a thing. Now, we did hear that you should not use cedar chips in a birds cage on the bottom, but I didn't realize that was why. If we don't know it, chance are most other people don't either, and we would hate to see this happen to anyone else. This couple is devastated, to say the least. They asked and we offered to post a note of warning about it for other people to read. We have a listing of Toxic and Non Toxic foods for your birds which can be found here.The other toxic things that we do know of is Teflon, Fabreeze fabric refresher, some types of glue used in laying new carpeting, self cleaning ovens, and in general anything that emits a strong odor. There are lists of plants and woods that are also not recommended or toxic to birds. If anyone else knows of something that is not mentioned here, it would be greatly appreciated if they could tell us and we could add it to the list. We make a point of always telling new people about the toxic things to birds, but this we did not know of, and we feel so bad for them. Often times people will bring their bird to the warehouse to be clipped, and they will have regurgitated in their carrying cages on the trip up. This is motion sickness. Some birds appear to be more prone to this, such as cockatoos. Motion sickness happens when what the eye sees does not match the input from the balance portion of the bird's ear.Birds fly under their own power and they are in control of what they are doing while in flight; they do not develop motion sickness. When motion sickness occurs, the bird cannot make sense of what it sees and feels, because the brain combines visual information with touch information and the inner ear information. When these three disagree, motion sickness results. Some signs in the early stages will be that the bird begins yawning, or may become restless or drowsy. Then more severe symptons occur, nausea, disorinetation, and fatigue. A bird may begin to regurgitate (this is from the crop) or it might vomit (this is from the stomach). There are a couple of things you might do to help relieve the situation. First, you may try to get the bird more used to riding in the car. First, take him out to the car in his carrier, and put him on the seat and start up the car, let it run for a few minutes, letting him get used to the sounds and vibrations. Then at another time, do this and then take him for a short ride. Do this a couple of times to get your bird more acclimated to the car. Another thing to do is to cover the carrier, and provide a fixed perch so there is no wobbling up and down. They do better if they can't see out the window. There are herbal remedies you might try, and they even make scopolamine patch for birds. These are options to discuss with your avian vet. Many customers have asked about a collar for their bird that may be having plucking or chewing issues. We found a website that has them available for a reasonable price and wanted to pass it along. As most of us in the Parrot family know, there are many factors that play into the health of our beloved feathered friends. Here we are going to post some articles that have been written about some of the problems that may occur with our birds. The first and second article were written by a very well know specialist on Eclectus parrots, Laurella Desborough. She was kind enough to reply to an email that Cindy had sent to her and we felt this information may help some of our customers. Thanks to Laurella for responding and sharing her thoughts. Most often toe tapping relates to diet items...BUT, it can also relate to the bird's body responding to some kind of "assault" such as when the bird breathes in the fumes from a cleaning agent, (you might not even notice the smell very much, but the bird does and if you can smell the item, it means microscopic particles are in the air and you are breathing them in...and so is the bird), something like Simple Green would do it....or walking on a sofa that had been sprained with stain repellant, or experiencing extreme cold for an hour, or sitting on the shoulder of someone wearing clothing that had gone through the drier when a fabric softener was used. Many different chemicals can cause toe tapping...including the chemicals and man made vitamins in pellets. So, I would think about any of the above possibilities or something similar, then review the diet. Sometimes there is nothing wrong with the diet items, but just the way the items work together can short circuit the body's utilization of calcium, which causes the muscle spasm. I would add endive leaves to the diet, fed separately from the regular foods. Endive keeps very well in the refrigerator in a plastic bag after being soaked and then the excess water drained off. So, add endive to the diet. I think that will help a lot. Well, I am very glad you have written to me about these eclectus issues since we do want good information to go out to eclectus owners and breeders. For eclectus pet owners and breeders, you might want to suggest they join the EclectusPetOwnersGroup@yahoogroups.com where we have many friendly pet owners and a few good eclectus breeders to answer questions and share stories and concerns. It is a pleasant group and no bashing or rudeness occurs so no one is embarrassed or hurt as in some net groups. You have presented me with a question about a complex matter. As you might expect, some of this feather chewing is related to allergic reactions to diet items AND to other irritants in the environment or to housing issues or wing clipping or pain. Diet items causing allergic reactions include not only colored pellets, but in some individual cases ANY pellets (especially for Solomons!). Seed mixes with added vitamins are a problem. Most commercial treats, like Nutriberries or Avicakes are allergy producers for eclectus parrots. Also, commercially produced human foods, such as pasta, bread, and cereal products, can all create allergic reactions in eclectus parrots if fed over a period of time. Sometimes one piece of pasta can do it...but that means the bird is on the edge of chemical imbalance in their system. Another reason, I believe, is that many pet eclectus never receive sufficient greens such as dandelion (from the grocery store), or endive, and celery. These three items are very important for eclectus parrots. I am including detailed information about that in the book I am writing about eclectus parrots. Extreme dryness in the environment can initiate feather chewing, such as in winter indoors, or such as in some states like Nevada at any time. So, in these cases, routine showers or baths or heavy spraying on the feathers with WATER ONLY will help a lot. Dirty feathers can cause feather chewing as the bird tries to get rid of the dirt. So, routine showers make a huge difference for the situation of dryness or dirty feathers. Another very serious factor for female eclectus parrots is the lack of a chewable perch. I simply cannot stress the importance of this enough. People do not realize that these birds have a genetic program that says CHEW ON WOOD. And, when they do not have chewable wood available, but instead have hard woods, like manzanita or ribbon wood, or perhaps rope perches or plastic perches, well, they cannot chew and that becomes a serious frustration so they chew on their feathers. We make a point of providing a high perch in all pet cages and in all breeder flights and this perch is of chewable soft wood, either pine or fir, untreated of course, right out of the lumber store, cut to fit the cage and attached on pet cages with a screw and appropriate washers or placed in a breeder cage in 2x4 hangers. The only female eclectus I have that chew feathers are those that have ARRIVED here in that condition...and some have improved over time. Serious stress from chemicals or from extremely painful events can result in feather destruction. Chemical stress can include exposure to strong cleaning agents, or aerosolized oils from candles or other items. Pain can cause feather chewing. Pain from inappropriate toe nail clippings where the tip has been cut right into the quick. We use a dremel to round the nail tips rather than cutting the tips off. Pain from arthritic problems, pain from heart problems, pain from broken bones, etc. 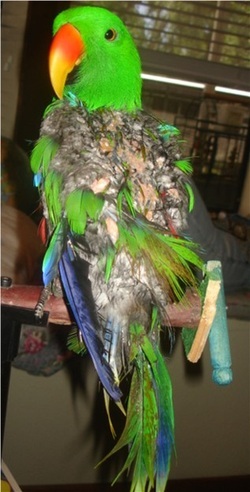 all these types of pain can cause feather destruction in parrots. When allergic reaction to colored pellets is severe enough to cause extreme irritation to the skin, eclectus will also chew on the flesh. Another reason to chew on the flesh is the presence of the fungus, candida, under the skin. This fungus exists in the environment and may become an irritant in the body of the bird IF the bird is not being fed the full complement of dietary items it needs to maintain a healthy body. Another reason for feather chewing is an inappropriate wing clip, which means ANY clipping of wing feathers where the cut ends are short. Those cut ends dig into the bird's sides and cause the bird to attempt to groom them...over and over and over...and the end result is a feather chewing habit. This is not only true of eclectus parrots, but of any parrot. We encourage our clients to keep birds fully flighted if possible and most do. Flying makes for a healthier pet bird anyway...exercises the air sacs which are not exercised otherwise. Inappropriate housing can create sufficient stress to induce feather chewing. Say a pair of eclectus parrots are housed in a macaw type cage, something 2 feet deep by 3 feet wide...now that is a disaster waiting to happen. Eclectus parrot pairs do not normally spend all their time so closely together so this is an abnormal situation. Young birds may tolerate it for a few months or a couple years and suddenly they start feather chewing as the stress mounts when they become adults. IMO non-breeding eclectus parrot pairs should EACH have their OWN CAGE. Otherwise, either the male or female may become sufficiently aggressive that the other bird is so stressed it plucks. This same scenario applies to two pet eclectus in the household. Keep in mind that in the wild, males and females do not travel together except for breeding pairs. Single males travel in male flocks most of the time. In my large 40 foot flight, I observe that the males interact and play with the males and the females chew on wood or tree branches. Once two birds become a pair, they do hang out together, but prior to that, no. I think that covers most of the reasons that eclectus parrots (and some other parrots) will chew or destroy feathers. You might want to send this entire message to those people you know who have birds that are chewing on their feathers and also refer them to my website:www.eclectusbreeder.com for diet information, and to the EclectusPetOwnersGroup for ongoing information and sharing thoughts. Also, I will announce on my website when my book on eclectus is ready.